Figure 3-37 illustrates a common situation. Air traffic control instructs you to fly to a waypoint via an inbound course different from the desired track calculated by the FMS. In the example in Figure 3-37, you are en route to SUNOL intersection. The FMS has calculated a desired track of 060 degrees, but ATC has instructed you to fly a heading of 080 degrees to intercept a 009-degree course to SUNOL. Figure 3-37. A simple course intercept scenario. The FMS is set to take the aircraft to SUNOL intersection, but via an inbound course different from the one ATC has cleared you to follow. Therefore, you need to be a means of programming the FMS to follow your choice of course instead of the desired track that it has identified. Nonsequencing mode allows you to select a different inbound course to the active waypoint. For this reason, some manufacturers refer to the nonsequencing mode as OBS (hold or suspend) mode, which suggests similarity to the OBS knob found on traditional VOR indicators. As the OBS knob allows you to select inbound VOR radials, the nonsequencing mode allows you to select inbound courses to an active waypoint. Nonsequencing mode stops the waypoint sequencing feature of the FMS/RNAV unit. If engaged in nonsequencing mode, the FMS/RNAV program does not automatically sequence to the next waypoint in the flight plan when the aircraft arrives at the active waypoint. Every FMS/RNAV offers a way to switch to the nonsequencing mode. There is typically a button marked OBS (or Hold), and an OBS or course selection knob to select an inbound course to the active waypoint. Figure 3-38 illustrates the procedure for one particular FMS. Once you switch to nonsequencing mode and select the inbound course of 009°, the navigation indicator reflects aircraft position with respect to the 009° course. The navigation indicator in Figure 3-38 shows that you are west of course. The assigned heading of 080° provides an acceptable intercept angle. As you fly the 080° heading, the needle centers as you reach the 009° course. Once the 009° course is reached and the needle has centered, you can turn to track the 009° course inbound to SUNOL. It is important to remember that the nonsequencing mode suspends the FMS/RNAV’s waypoint sequencing function. If you reach SUNOL and the unit is still set in the nonsequencing mode, it will not sequence on to the next waypoint. Generally, once established on a direct course to waypoint or navaid, switching back to sequencing (releasing the Hold or Suspend function) mode allows the FMS/RNAV to continue to the programmed point and thence onward according to the programmed routing. Setting the computer back to the sequencing mode is usually accomplished by pressing the OBS (Hold or Suspend) button again. By far the most common error made with the nonsequencing mode is forgetting to re-engage the sequencing mode once the course has been intercepted. The result is that the FMS will not sequence to the next waypoint in the flight route upon reaching the active waypoint. The best indicator of this event is the “To/From” navigation display showing “From.” Normally all FMS fly “To” the waypoint, unless that unit does holding patterns. Flying “From” a waypoint can only be done in the “OBS”/“Hold”/“Suspend” mode. Figure 3-39 illustrates a slightly more complicated request often made by air traffic control. While en route to SUNOL, ATC instructs you to fly a heading of 060° to intercept and track the 049 course to TRACY. This situation requires two separate tasks: changing not only the inbound course, but also the active waypoint. Figure 3-39. A more complicated course intercept scenario. The first step is to change the active waypoint using the direct-to function, as illustrated in Figure 3-40. Remember, though, that if you use the direct-to function to make TRACY the active waypoint, the FMS calculates a desired track that takes you from the present position to TRACY intersection. Figure 3-40. Intercepting a course to a different waypoint. The second step, illustrated in Figure 3-40, is to change the desired track to TRACY by setting the computer in the nonsequencing mode and selecting the inbound course. You now continue on the assigned heading until the needle centers, then set the FMS back to the sequencing mode, and continue inbound on the assigned course to TRACY intersection. 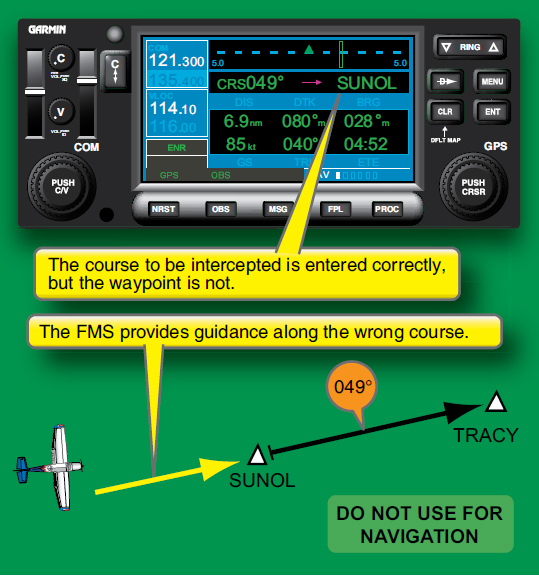 One common error made during course intercepts is to select the wrong course to the active waypoint. Some FMSs automatically set the course indicator (“slew” the needle) to the inbound course. Where this capability does not exist, pilots occasionally select the heading that they have been assigned to fly to intercept the course instead of the inbound course. The outcome of this error is illustrated in Figure 3-41. Figure 3-41. Selecting the wrong course to the active waypoint. Another common error is failing to realize that ATC has instructed you to intercept a course to a different waypoint. Figure 3-42 shows the outcome when the pilot neglects to set TRACY as the active waypoint in the previous example. 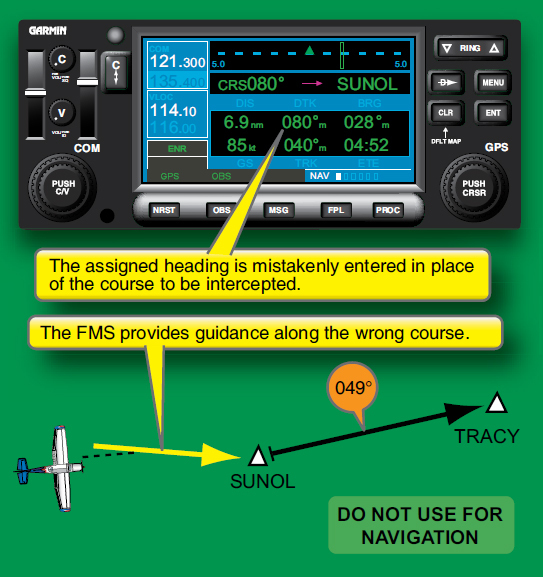 The FMS offers guidance along the correct course, but to the wrong waypoint. Figure 3-42. Setting the wrong active waypoint. Question #1: Where am I going? Point to the active waypoint on the navigation page and make sure it shows the waypoint that you wish to fly toward. Question #2: How am I getting there? Point out the desired track to the active waypoint on the navigation page. If it is not the one you want, engage the nonsequencing mode and select the course you want. Program and select a different course to the active waypoint. Select the nonsequencing waypoint function (OBS, Hold, or Suspend) to select a specified navigation point. Reactivate the sequencing function for route navigation.